Chiang Rai is a golfers paradise, endowed with 2 championship golf courses and many varied natural tourist attractions and antiquities. 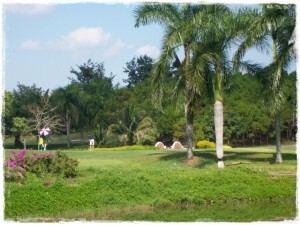 Chiang Rai is the ideal place for a golf and excursion holiday. There are 4 golf courses just around the city, mst with magnificent views of surrounding hills and valleys. Include the biggest one of the world, “Happy City” golf course with 28 holes. We pick you up at the airport or bus station of Chiang Rai. Welcome in Homestay Chiang Rai resort with welcome drinks. In the afternoon we visit the White Temple ( Wat Rong Khun ). Golf day at the Royal Army 18 hole golf course. Excursion to the Golden Triangle ( with English speaking guide ). This day we visit a “Long-neck” Karen village, Mae Sai border town with Myanmar, the Golden Triangle, a boat trip to an island of Laos ( no visa necessary ), the Opium Museum and Chiang Saen. 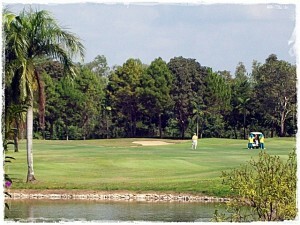 Golf day today you will play at Santiburi golf course ( 18 holes ). Excursion with a Longtail boat ( including English speaking guide ). We visit the elephant village Ruam Mit, here we make a trip on a elephant for one hour. We continue our boat trip to a Hill Tribe village and visit on the end the Hot Springs. Here you can relax in a private spa cabin and have a swim. Golf day, today you will play golf at “Happy City” golf course ( 18 holes ). Golf day, today you will play golf at “Waterford” golf course ( 18 holes ). After breakfast, departure for the next destination, or extend your holiday at Homestay Chiang Rai a few more days. This is excluded frm the published program price. The total price of the above package is 26.700 THB per person ( minimum 2 persons ).